While there were previously some rumors, speculation and teasing that Dwayne Johnson may appear as Black Adam in a Warner Bros./DC film released prior to 2019's Shazam, nothing has thus far come to light to give fans any certainty. We still can't etch it in stone, but it now sounds a bit more promising that the highly-anticipated character may indeed pop up much sooner than we thought. In a recent interview with IGN, The Rock, out promoting Furious 7, was asked to discuss the potential of his character Black Adam appearing in Zack Snyder's upcoming film The Justice League Part One, hitting theaters in 2017. Here's what the actor had to say. I think so, and I think you always want to leave that creatively open, that he could join the Justice League and I think... that's the fun part of creating this character right now and everybody involved, from the studio, from New Line, to Warner Bros as well, to the writer, our producing partners. You want to... you definitely want to engage in his heroic side, but that has to be earned and with the mythology of Black Adam starting off as a slave, because when you start off as a slave, just inherently, there's things in your DNA that piss you off. While it isn't the type of confirmation we'd like to hear, it does open up a very interesting possibility. We already know from previous conversations with Johnson that his character will likely eventually square off onscreen against the likes of Superman and/or Batman but doing it this early on in the game seems somewhat unlikely. On the flip side, Shazam won't hit theaters for another four years, which sounds like an awfully long time to hold out on giving fans a taste of his character. Johnson did go on to say he thinks they "have to respect and pay homage to the true mythology" of his character, prior to revealing his heroic side "down the line," which means he will likely first arrive as the corrupted character as originally depicted in the world of the comics. If he does end up showing up in Justice League Part One, could we really see him facing off against Henry Cavill's Superman? 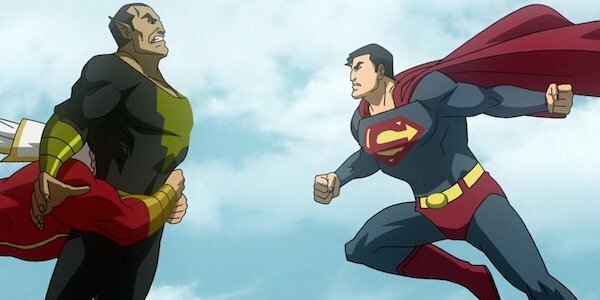 Personally, I think it would be cool to see a brief intro or cameo of Black Adam in 2017's Justice League Part 1, after which Shazam would debut in April of 2019, followed by Justice League Part Two hitting theaters two months later (in which his character could play a larger role). What do you think? Will we, should we (or do you even want to) see Black Adam show up in the Justice League films pre or post-Shazam?